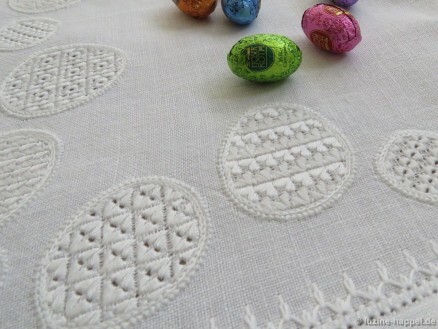 Easter eggs are especially suited for trying out different patterns. Because of the rounded shape without small or pointed areas, the arrangement of the pattern at the edges is easy to work. I wanted a border design, but there were so many issues to consider: Which sizes of eggs create a nice balance? Which shapes are best? How tall should they be? How should they be angled? 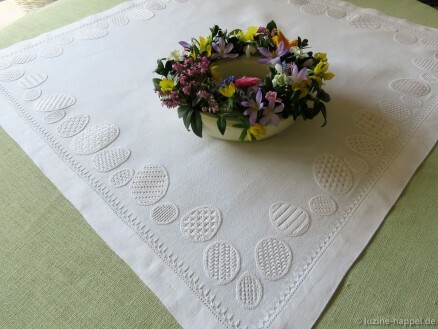 I preferred to ask an artist; Artist Gudrun Hartwig designed this special Easter border. The border shows Easter eggs lying in the grass. Some Easter eggs lie on the straight of grain and some on the bias. I decided to decorate the edges of a square tea cloth with the border. It measures 75 cm X 75 cm. To simulate grass, I used “Trachtenstitch” (see Fancy Hems pages 14–16). Each of the fifty-four eggs got its own special pattern. This was a real pleasure to stitch. 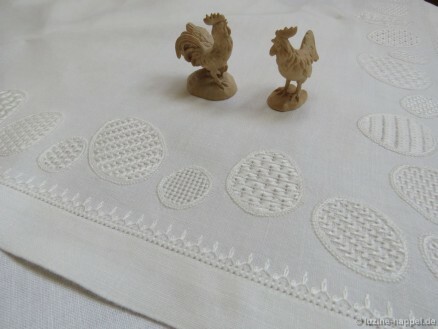 I used exclusively square eyelet patterns, most can be found in my Limetrosen I book. The patterns in Limetrosen I are perfect for the egg shapes. And the variety of patterns in the book is vast – there are patterns for small shapes and big shapes, patterns appropriate for working on the straight of grain and on the bias. There are even some patterns for slanting shapes. 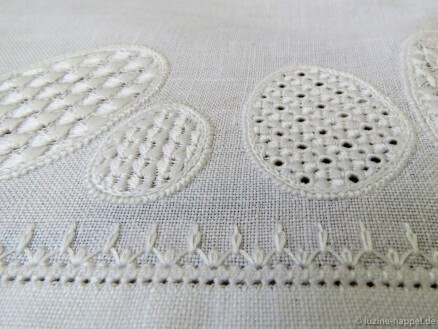 The Limetrosen patterns use more thread than many other stitches. 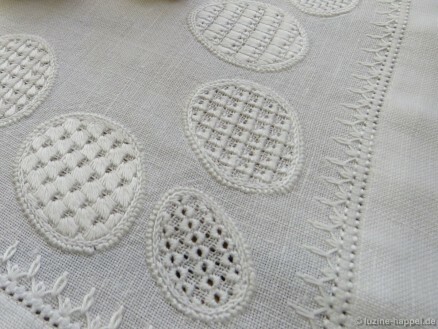 But the effect of the threads, dense and lying in different directions on top of the fabric, is very pleasant indeed. Chiaroscuro – the interplay of light and shadow – makes the border beautiful, although is is unadorned. My tea cloth is eye catching. 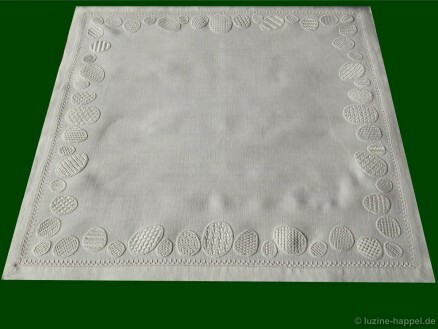 The whitework is timeless; it complements all kinds of crockery, flowers, and contemporary decorations. Both are just beautiful? 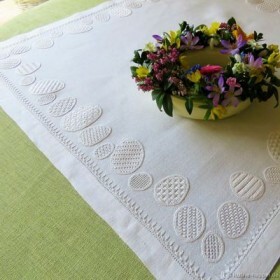 Where can one find the pattern / kit for the spring break table topper? You think of the pattern in the bottom image of the German part of my blog? 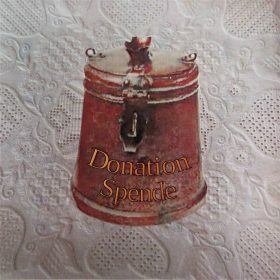 You can get it as a printed on linen design. If you are interested in details like size or price, please email me. Der Osterläufer ist so schön. Eine gelungene Arbeit. Thank you for these beautiful designs. Thank you, Ana-Maria, my ideas for designs and for filling the shapes are nearly endless. Unfortunately my time to try out all my ideas is not endless. Hence I like designs being not too much elaborate . I do not sell fabric with printed patterns, but a friend of mine does. She has no website. So I can help.But the Easter Egg Border is a my design. You can get it as paper design only. She has – for example – a print of another Easter design. Please look to the last image on the Easter Egg Border article of the German version.